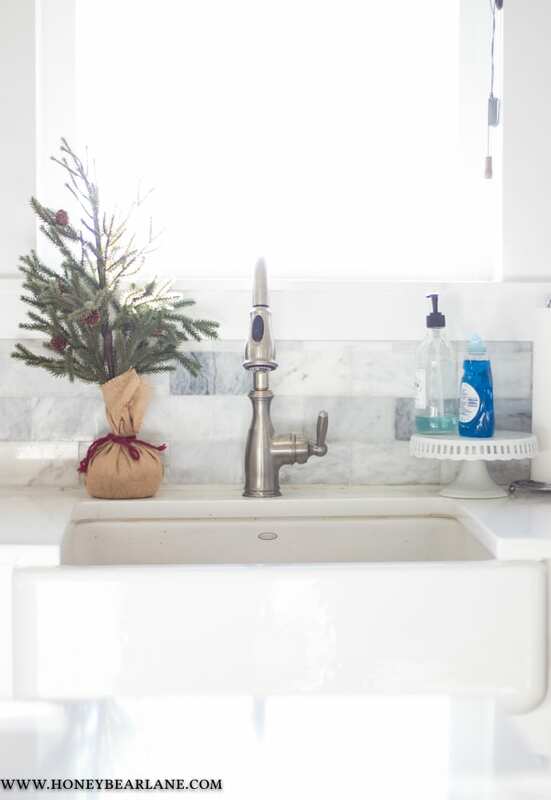 Huge thanks to Balsam Hill for sponsoring this post; all opinions are my own. Hello everyone! 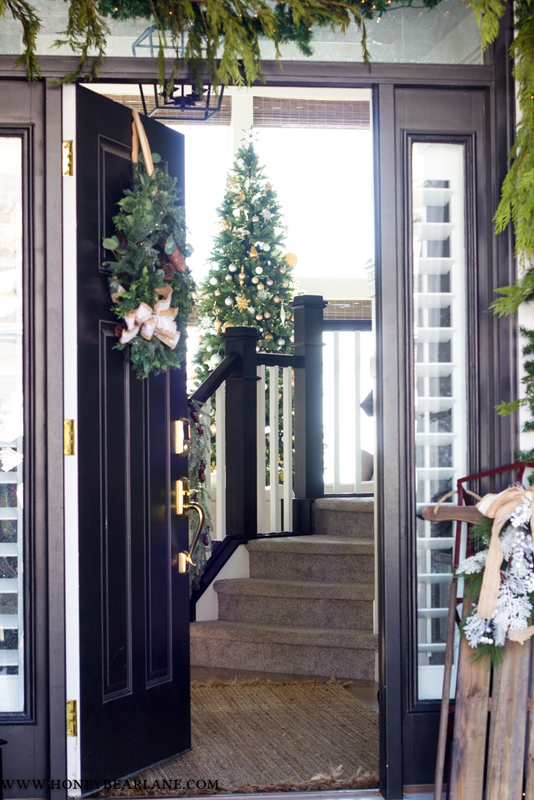 I’m beyond excited to be participating in the Balsam Hill Holiday Housewalk this year! 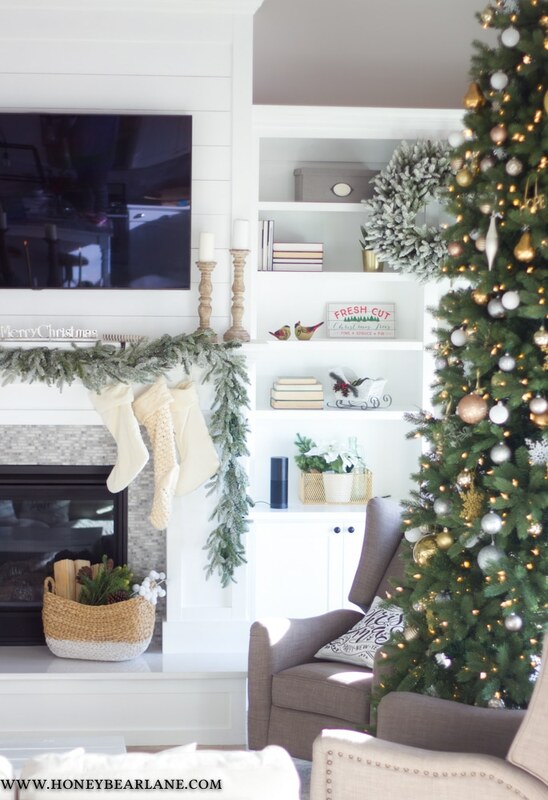 Last year was my first Christmas house tour and it was so much fun. 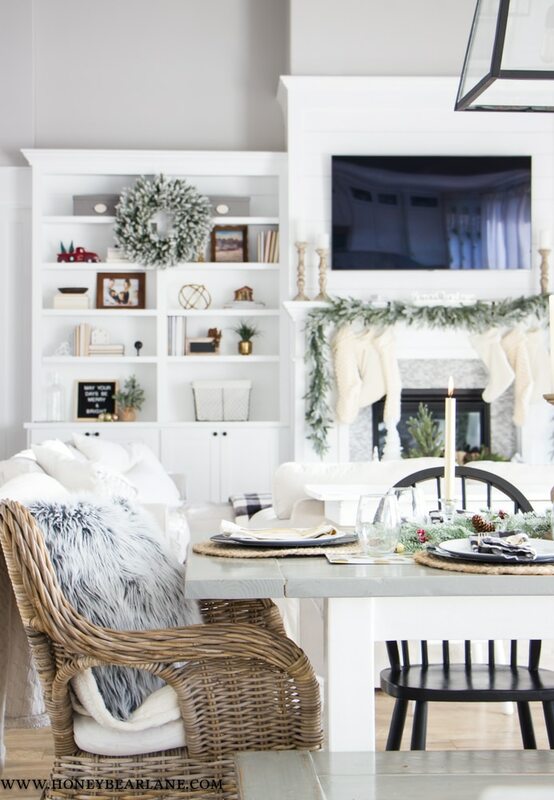 I love being able to see everyone’s holiday decor and get inspiration as well as seeing how I can change up my own. 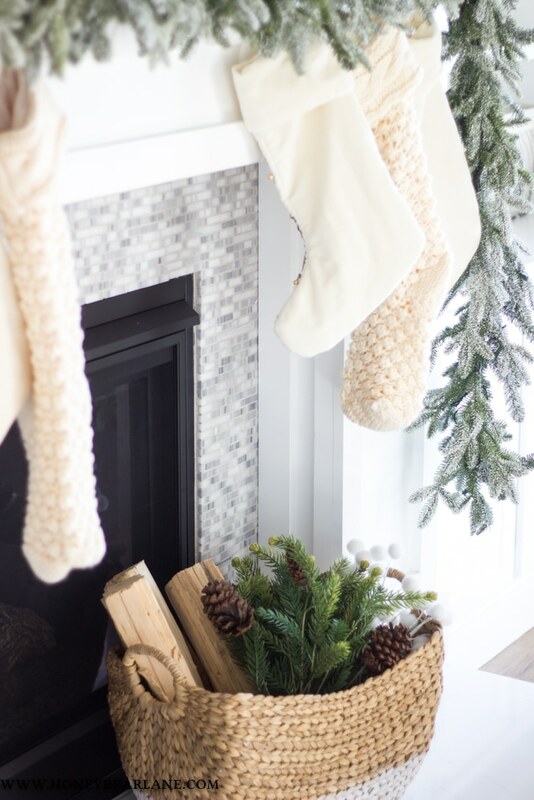 I have a TON of pictures for my housewalk so just buckle down, sip some hot cocoa, and enjoy the warm fuzzies you get from looking at Christmas decorations! 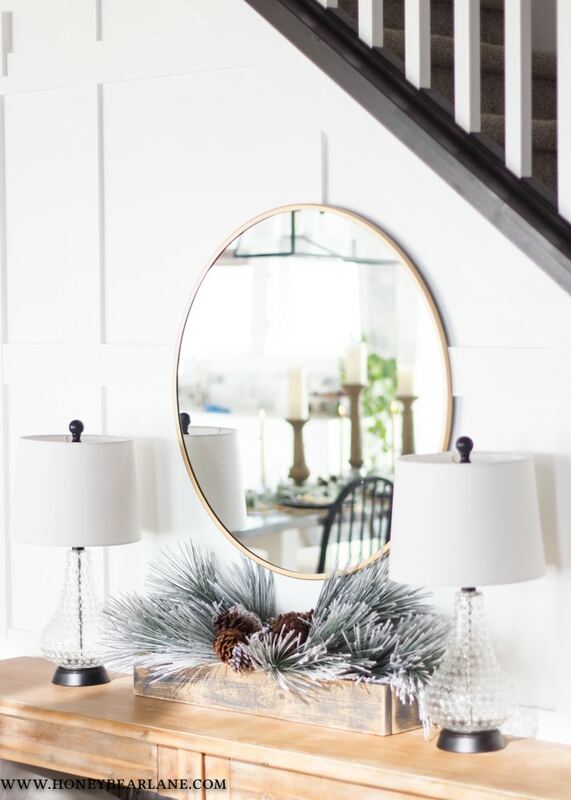 First off, a HUGE thanks to Balsam Hill for providing me with some of my most favorite and best quality holiday decorations this year. I seriously feel like it has taken my space from amateur to professional looking–if I do say so myself! Lets start with the front porch. 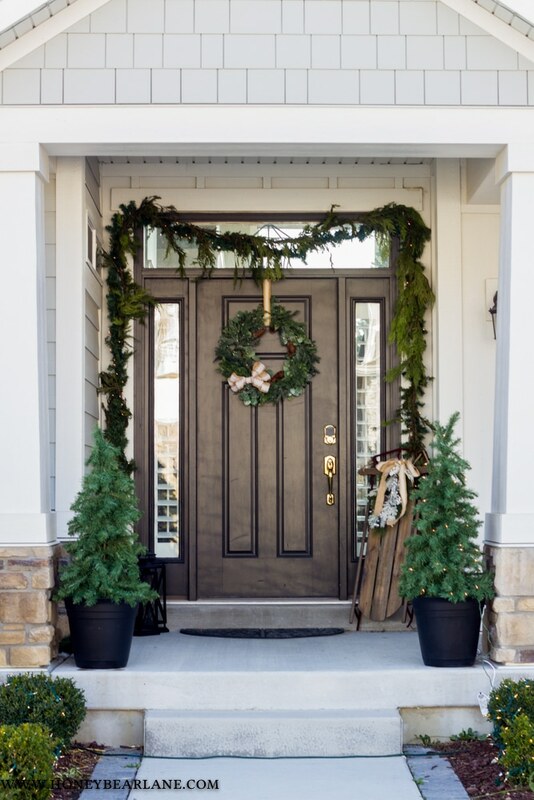 I never go crazy with front porch decor because we get some really wild wind storms in the winter and lots of stuff ends up blown over or completely missing. I even hung a wreath on windows above the garage and it was basically destroyed the next day. Bummer. But I did do some stuff–starting with garland of course! I mixed some of the cheap lighted garland with real garland for a more full and lit effect. 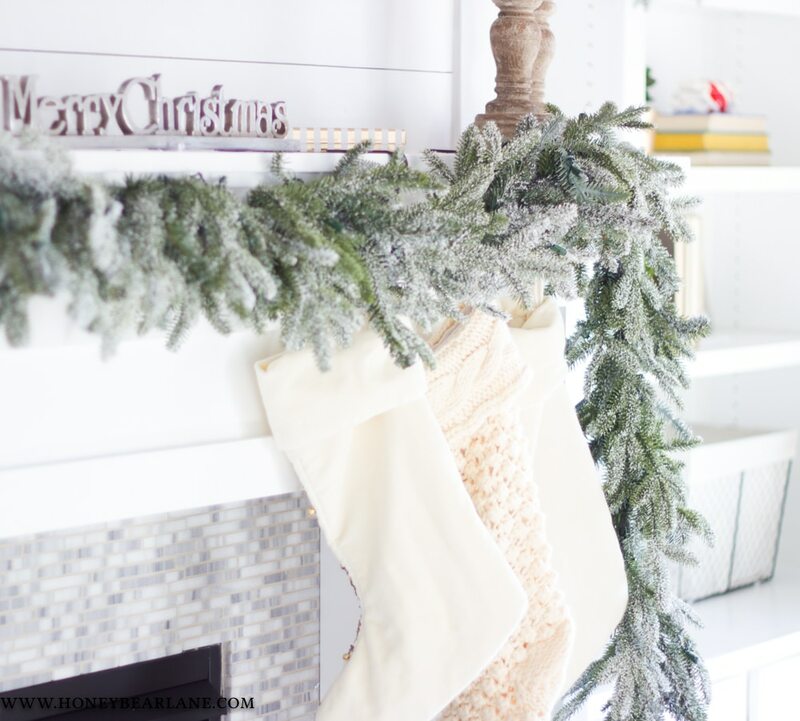 The real garland is amazing but I won’t do it in my house again–WAY too messy! 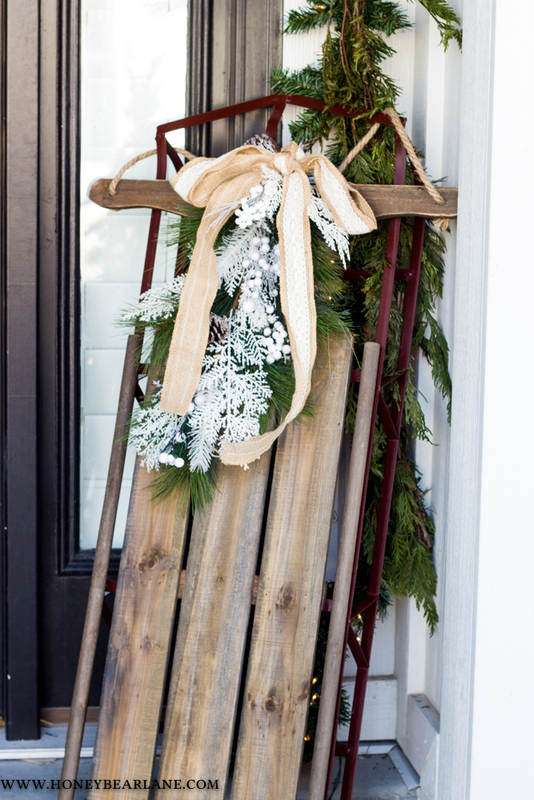 I added this cute old fashioned sled from Balsam Hill in one corner, topped with a little faux greenery and ribbon. I have some pre-lit trees (one of which you might notice is not working…I hate that!) and my hubby went and put lights over all the trees and bushes in the front yard. We LOVE having Christmas lights! Now it just needs to snow and it will start to really feel like Christmas. It’s been a super warm and dry winter so far…I don’t hate it, but it doesn’t feel very Christmasy! 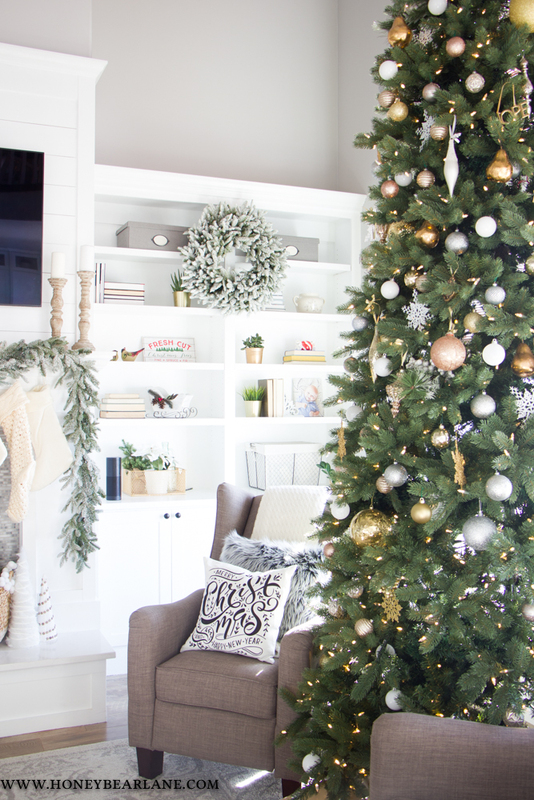 Let’s take a peek inside…oh, there’s my 12-foot Christmas tree! I’m skipping the entry because I’m saving that to share for another house tour I’m doing later this week. You won’t want to miss that though because it’s EXTRA special. 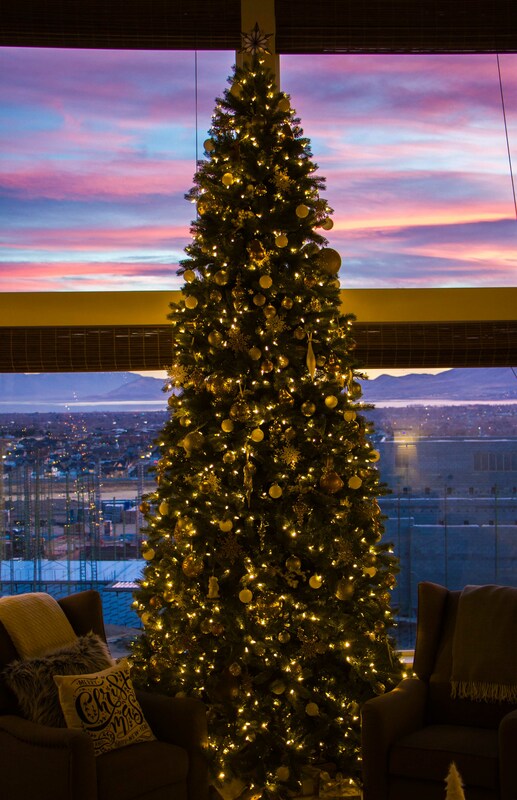 In the family room, it’s just the heart of Christmas. We have our 12-foot Christmas tree we got a few years ago and it’s taken me some time to figure out the best way to decorate it. This year actually is my fave. 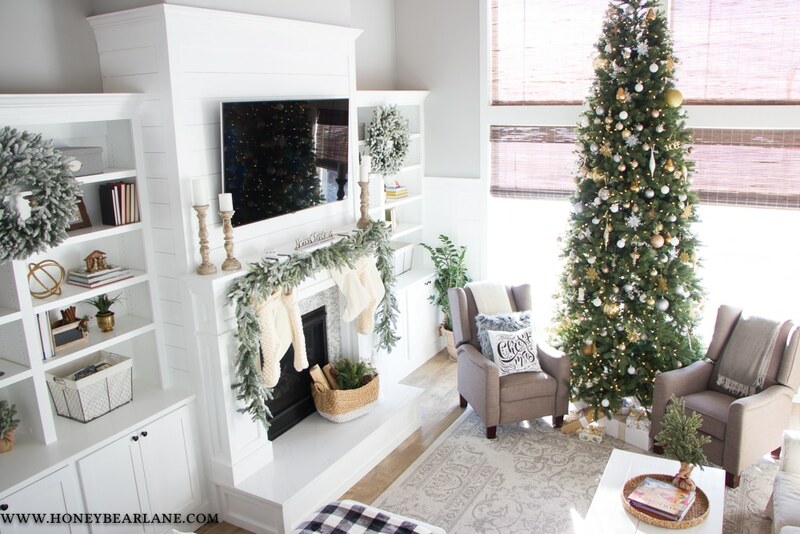 I kept it simple with most just ornaments and kept the color pallet neutral with only white, gold, silver, and some rose gold. 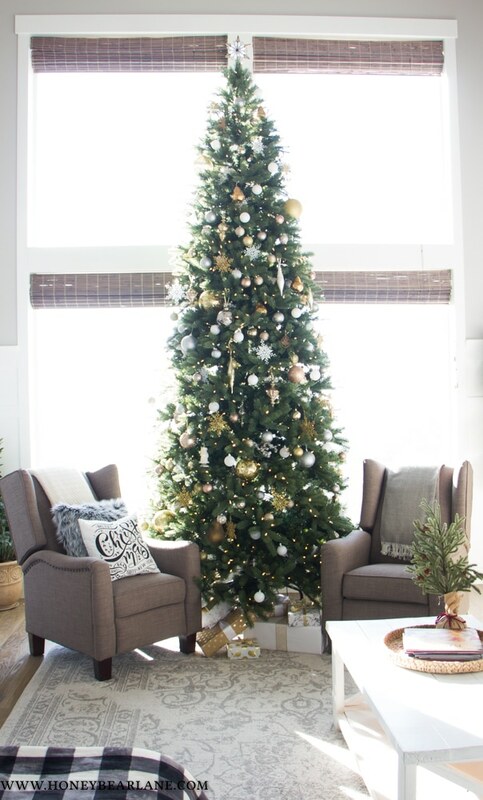 I realized that decorating such a tall tree, you actually do better keeping it more simple rather than trying to cram it full of stuff because 1) that’s expensive and 2) it just looks too cluttery. Plus my toddler keep un-decorating it so simple is better. 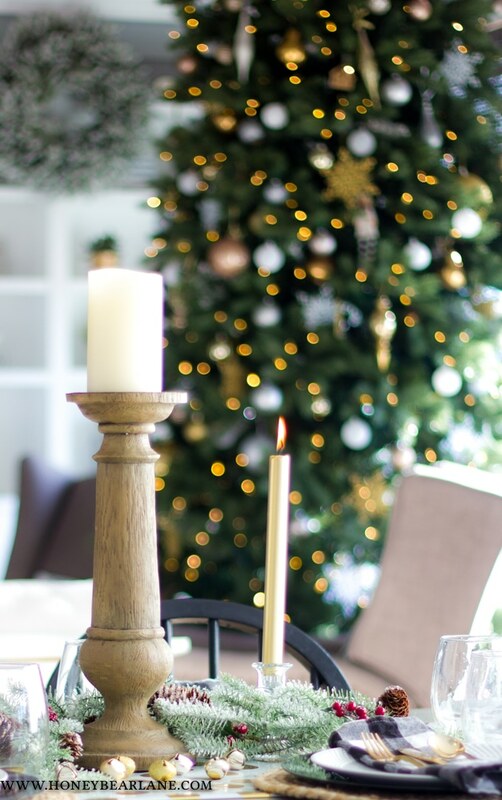 If you check out this post from my first year, I seriously cringe–I really hate the way it’s decorated. I love it this year though! 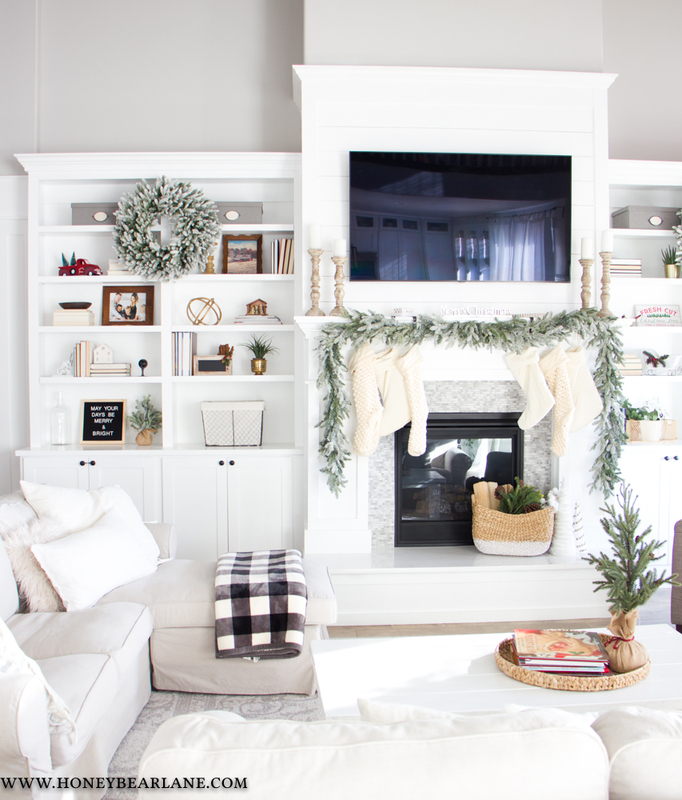 The biggest difference this year is obviously having the built-ins and I just ADORE having them…I can’t even. If we had to sell our house I would miss them the most of anything. 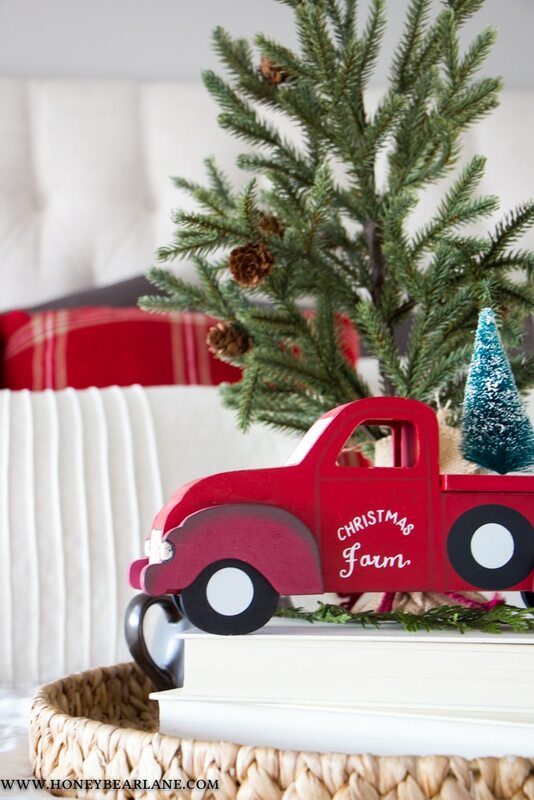 I kept the decor simple, adding some Christmas elements on the shelves like this cute house from the Target dollar spot. 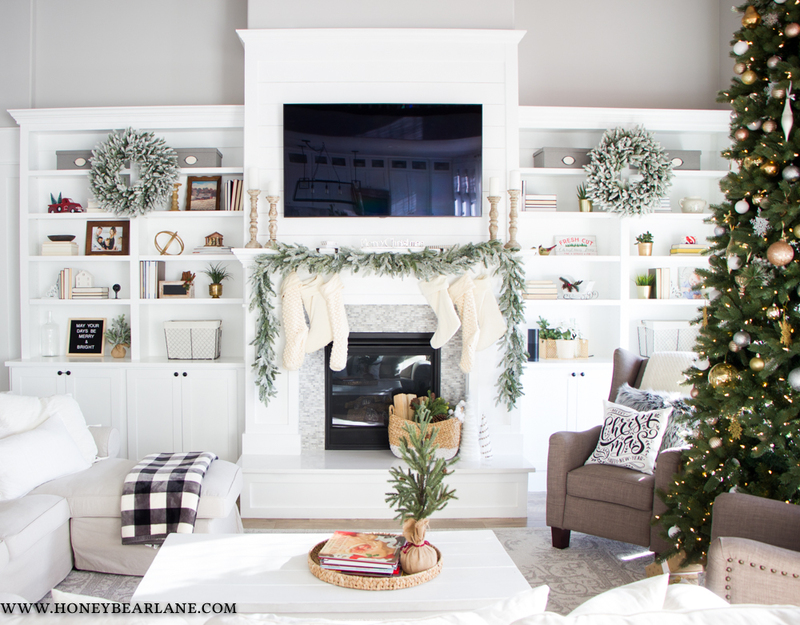 I hung these pre-lit Frosted Fraser Fir wreaths from Balsam Hill on each side and then hung two strands of Balsam Hill Frosted Fraser Fir pre-lit garland on the mantel. I use fishing line and Command hooks to hang them from each corner and the middle. The battery packs are in the center, covered by the branches of the garland. 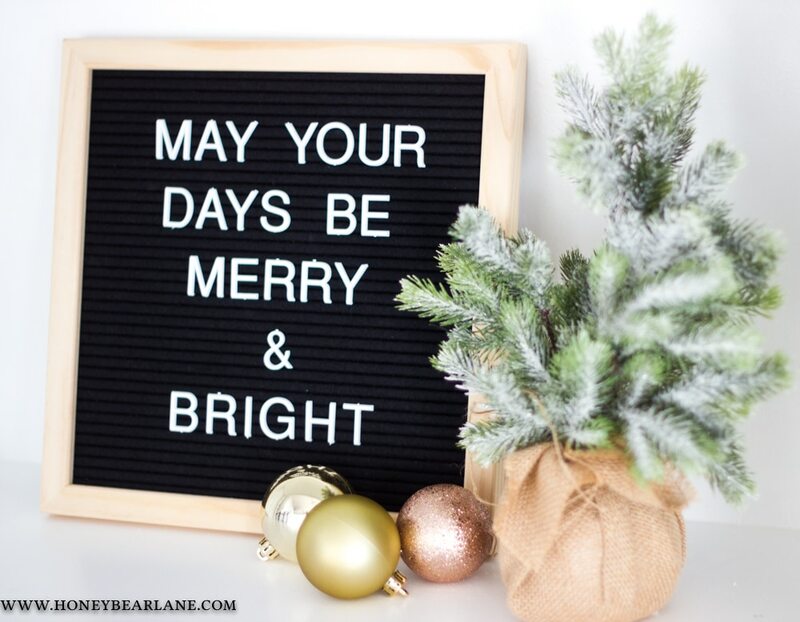 This garland and wreaths are super realistic and high quality…very full and each brand is wired so you can bend it here and there to get it the direction you want. But check it out at night! 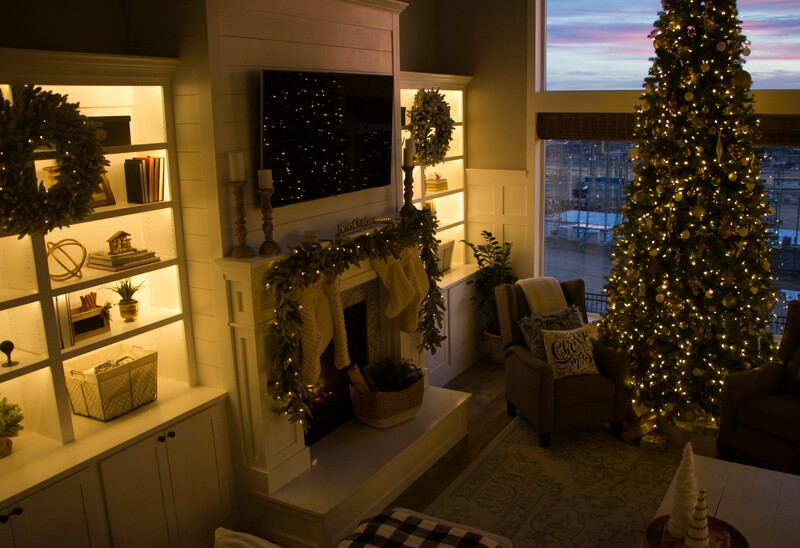 Both the wreaths and the garland are pre-lit, and of course with our Christmas tree, it’s such a beautiful space to spend the evening. I love to curl up with a blanket and some hot chocolate and watch me some Hallmark Christmas movies. Our sunsets have been sooooo beautiful lately. Ignore the construction behind the house. Bleh. Full disclosure here–I really never have my table set like this. I ADORE the way it looks, but having a 1-year-old around who climbs on and destroys everything…yeah. But for this housewalk, I decked the table out for what it would look like if I were to have a tablescape. Isn’t it so pretty? 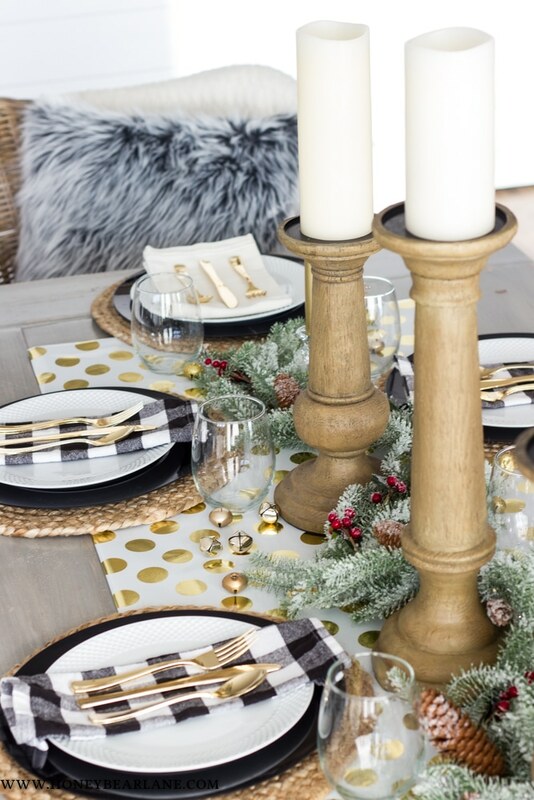 I combined gold, black, and natural elements for a pretty but glamorous tablescape. 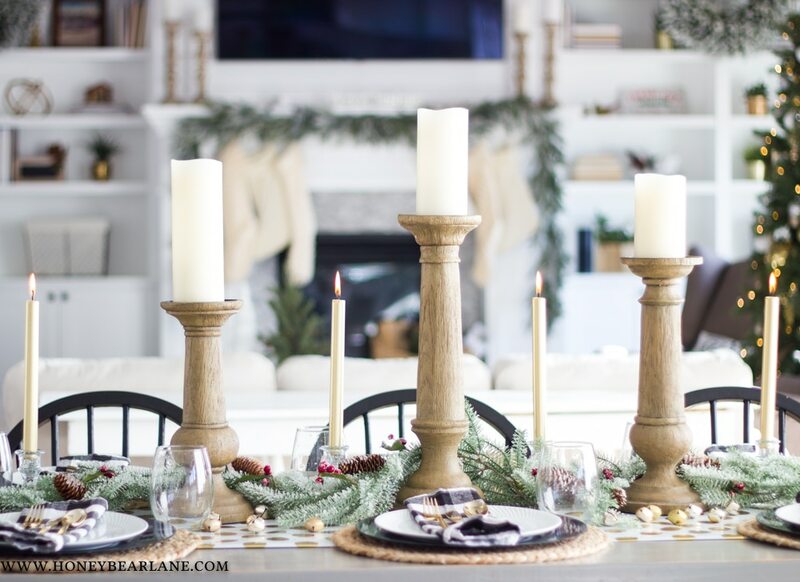 I got the faux bois candle holders from Balsam Hill and they were huge! I got the Balsam Hill LED candles to go with them (and bonus, they come with a remote!) 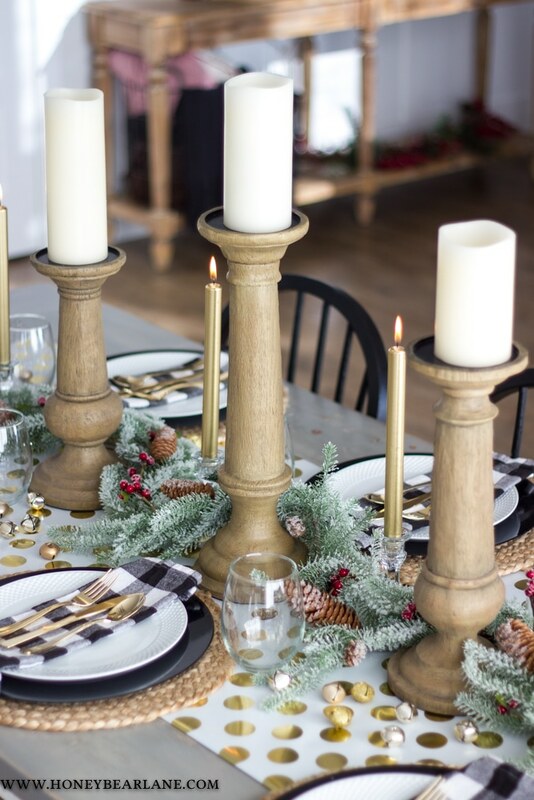 so coupled with some smaller gold candles, it balances out the large size of the faux bois candles. I made the table runner which I will share with you later this week. I used woven placemats, black charges, and white plates. I used Buffalo check napkins and gold silverware* with some pretty stemless wine glasses. 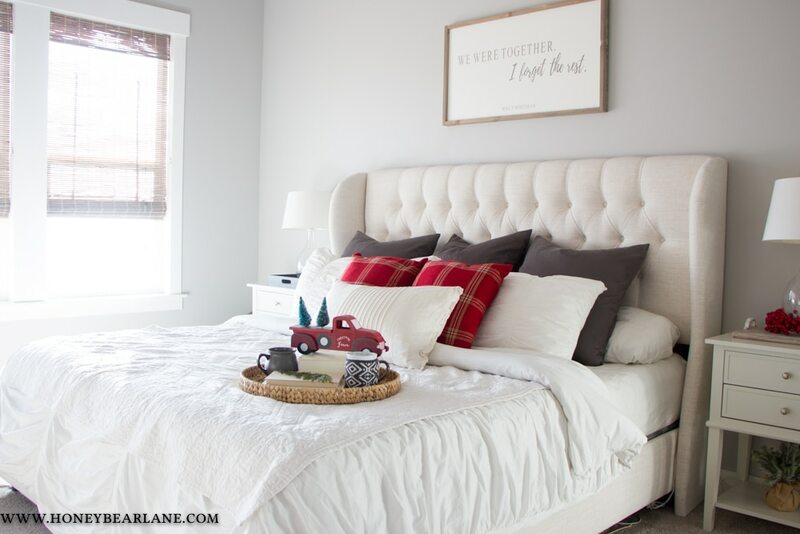 The bold patterns with plain neutral colors make it pop. 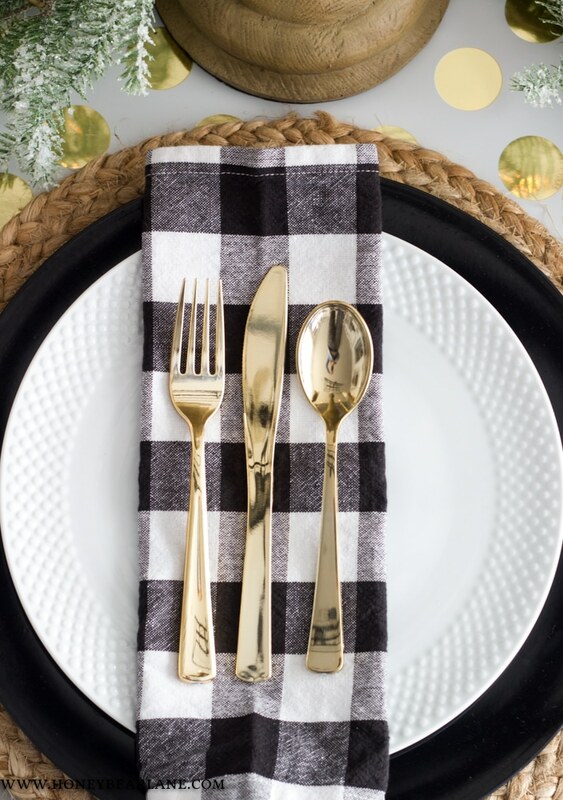 *Blogger Secret: this gold silverware is plastic! I got it from a craft store and I use it solely for pictures. My own silverware never looks this shiny haha! Before I take you to the kitchen, lets peek into my bedroom. 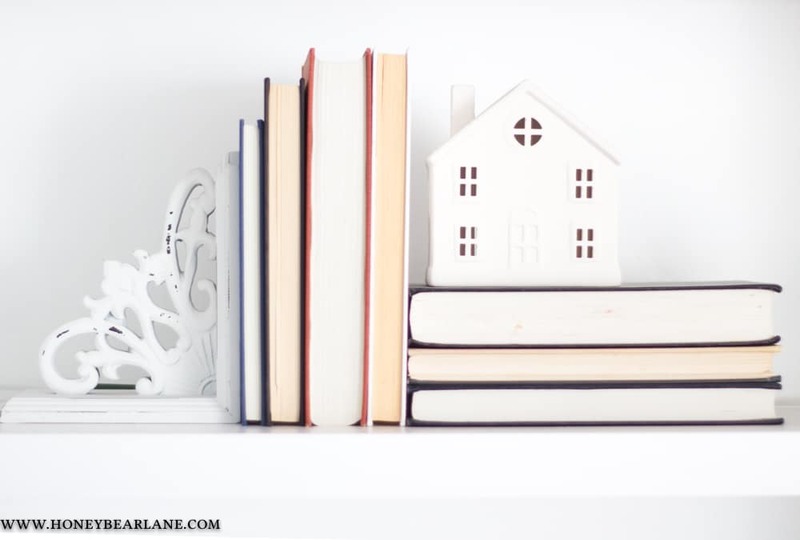 I am planning on hopefully doing some things to this space in the next little while, but I like to keep this room pretty tidy and clutter-free. 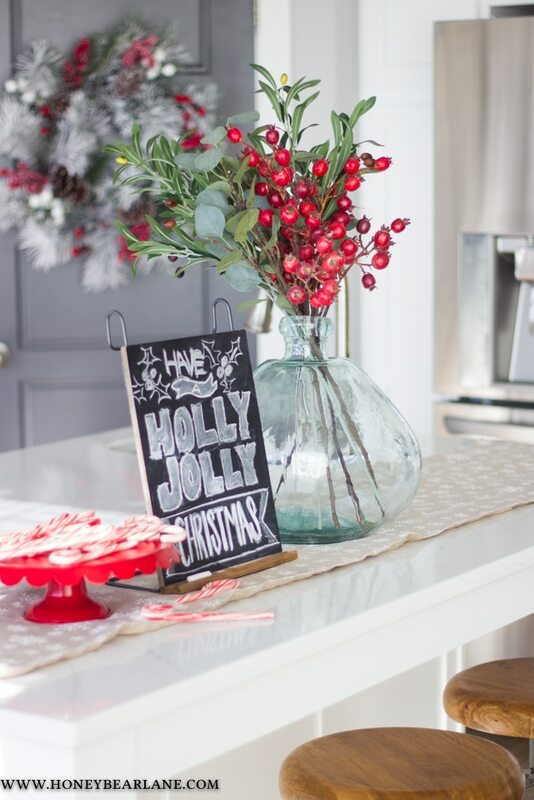 Even having Christmas decor in here is pushing it but it’s fun to decorate for the season. I love having the little Christmas lights in the corner. I made the little flocked trees last year and had them in the entry. This year I tried them first in the family room but I couldn’t figure out a good way to plug them in without cords going everywhere so they ended up here in the bedroom. You can never have enough trees! 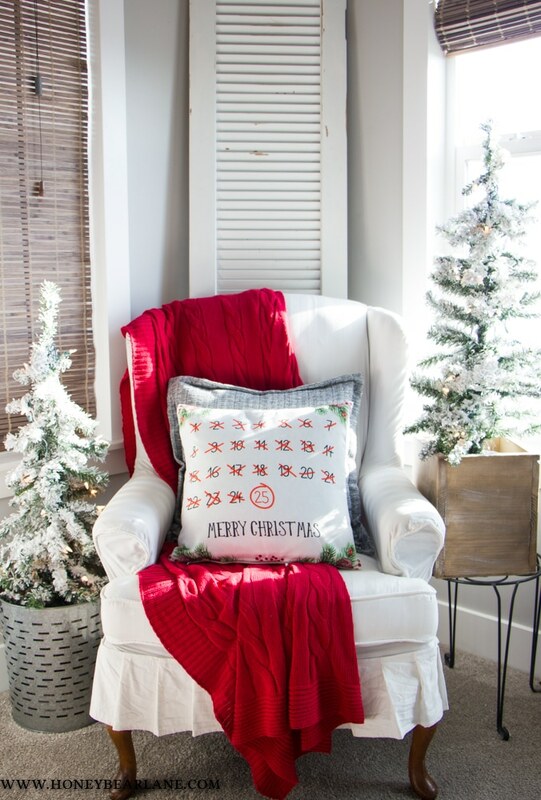 And how cute is that countdown Christmas pillow?! 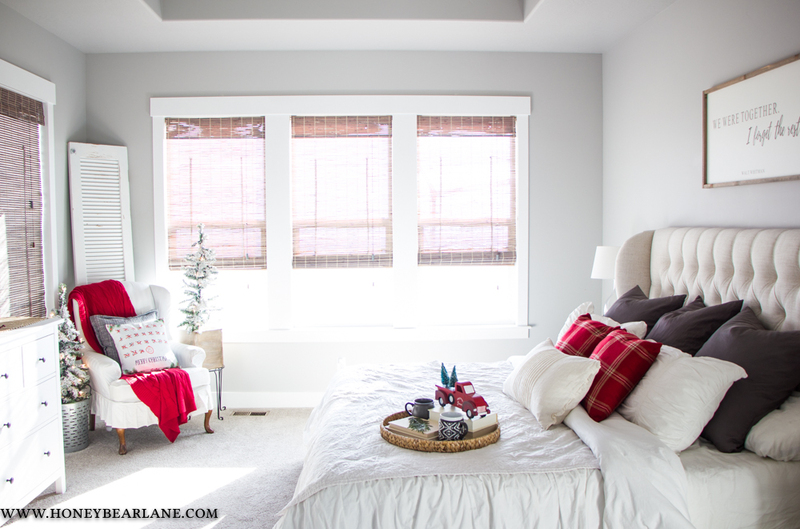 My bed is made ‘Christmasy’ by adding a couple plaid pillows, easy as that! I also threw an old quilt on top of my duvet because it gives it a little more farmhouse charm. I added some red berries around the lamp and some garland on the dresser. Easy peasy! 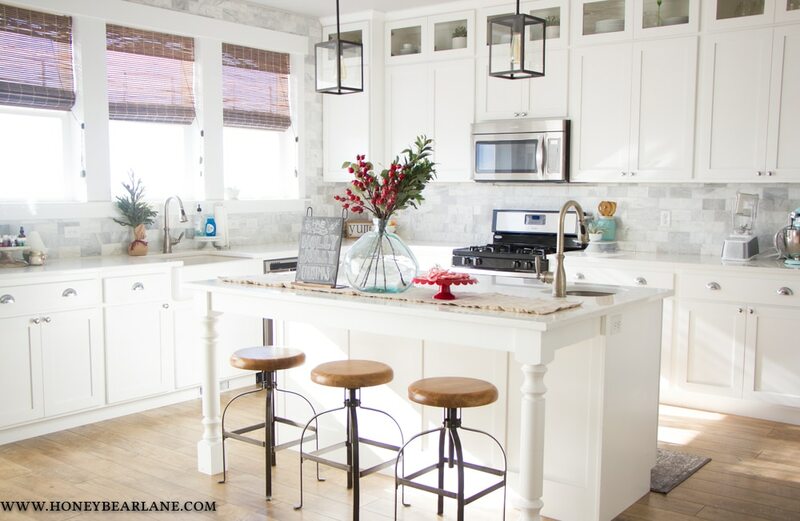 Last but not least is the kitchen. 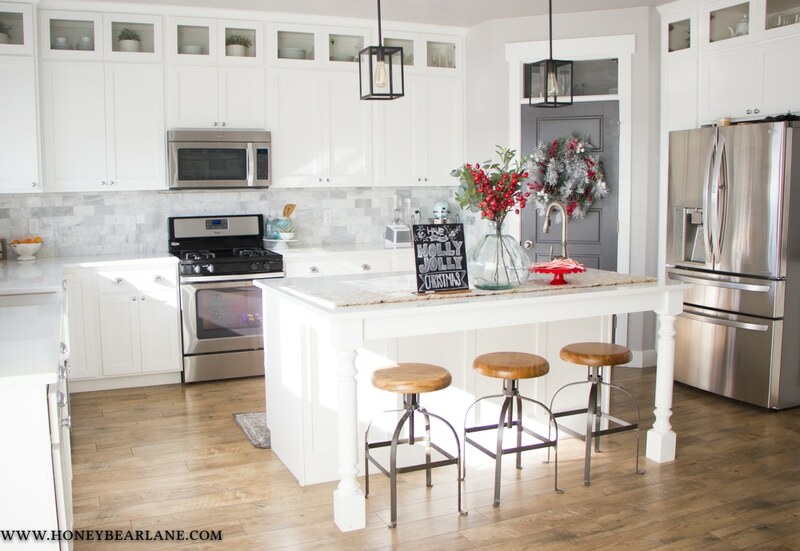 I never do a lot of decorating in the kitchen because I don’t need it to get even more cluttered than it already is! 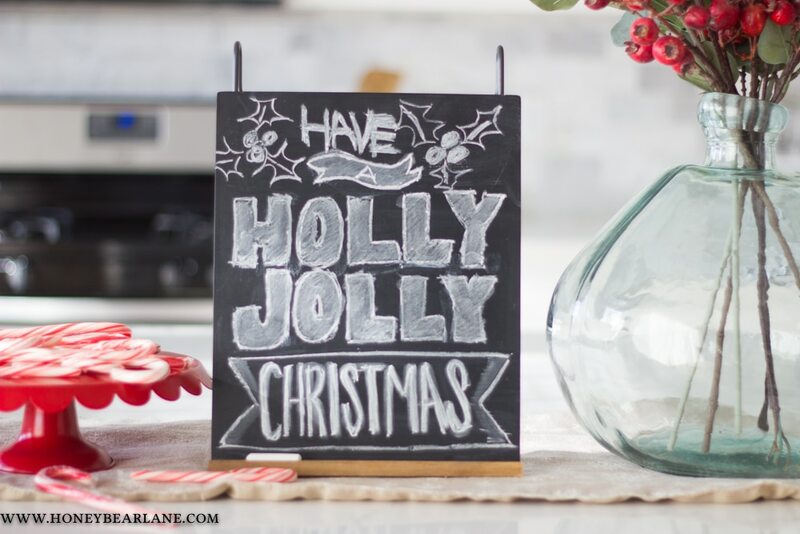 I set out this pretty table runner with a few Christmas things on it and did a chalkboard sign. 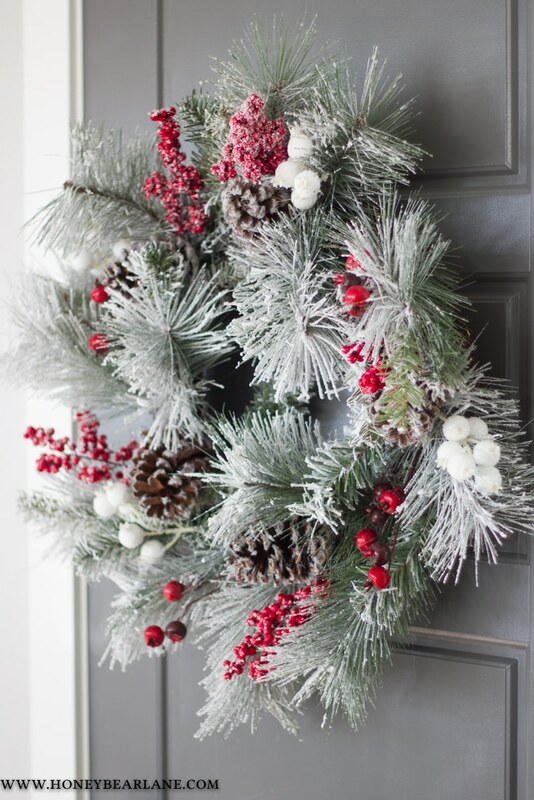 And a wreath on the pantry door. 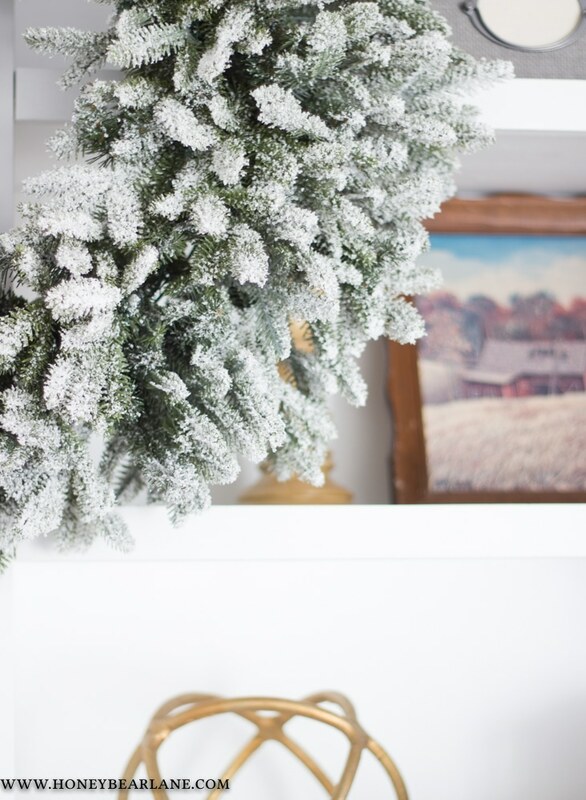 I’m loving my decor this year…and I really feel like each year my style gets a little more refined. I don’t know how or if I will change it much to next year! Thanks again to Balsam Hill for letting me participate in the Holiday Housewalk! 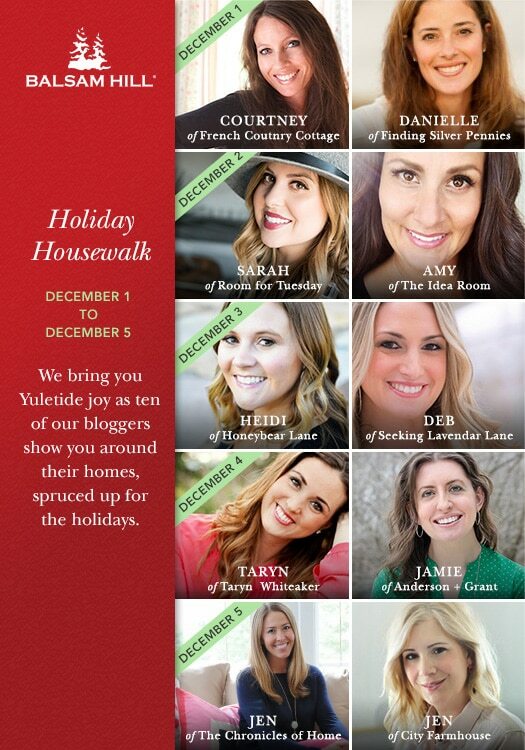 Be sure to check out the other blogger housewalks! Amazing!!!!! This is so beautiful <3 I love everything about it!